Obstetric wheels are a mainstay in clinical prenatal care, but they aren’t exactly optimal for carrying around. Their bulky shape makes them difficult to store anywhere other than in a white coat pocket and the flimsiness of their design allows for significant wear & tear with regular use. If you’re anything like me, you’d really like to move away from wearing a petri dish white coat every day, this is one reason the clinical utility of smart-phone apps is so interesting to me. However, without a replacement that is time-efficient, accurate and easy-to-use, nobody is going to be tossing their traditional OB wheel any time soon. Fortunately, developer Evan Schoenberg, M.D. has gotten it right with his simply-designed and incredibly useful app, Perfect OB Wheel. This intuitive app covers all the basics of an OB wheel and — thanks in large part to its intuitive design — makes date-calculations even faster than they would be using the old-fashioned way. The interface is well-designed and very simple to navigate. While not exquisitely colorful or exciting in design, its simplicity speaks to the app’s purpose. This wheel gets the job done without added frill in order to ensure speed and effectiveness of use. It’s clean, straight-forward and far from cluttered – just what an app serving such a simple, yet extremely valuable, purpose should be. Upon opening the app you are directed from the loading page to a self-explanatory options page. 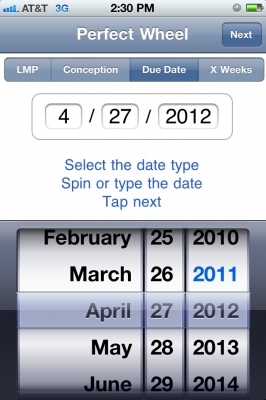 This options area is where Perfect OB Wheel really excels – unlike many other OB Wheel apps that allow calculation based only on last menstrual period, this one allows the user a choice of entering data based on Last Menstrual Period (LMP), Conception Date, Due Date or Number of Gestational Weeks. As a provider you know there is often large differences in what information is provided at a specific visit and this flexibility allows rapid calculation of obstetrical data using any piece of the puzzle provided. 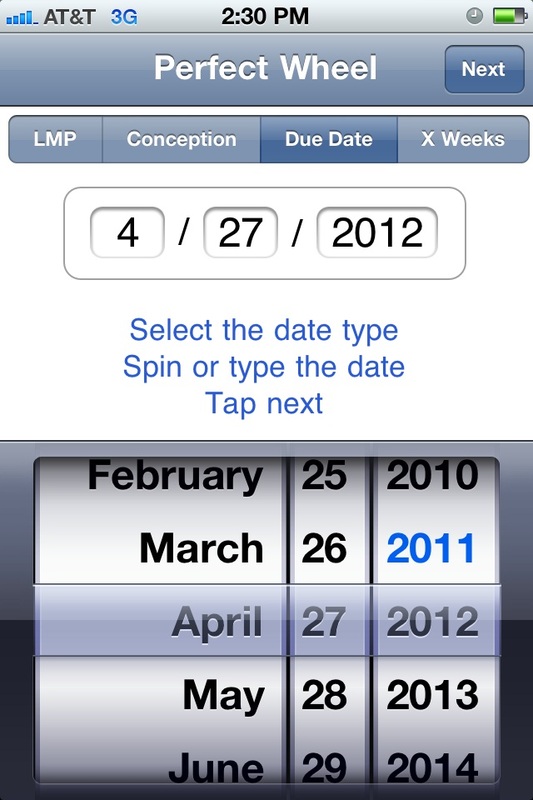 The ability to enter dates in either wheel format or numerical-typing makes the app even more flexible than it first appears. Following entry of whatever tidbit of information is chosen, a one-click navigation to the data page provides a plethora of well-organized information regarding the pregnancy’s current state. 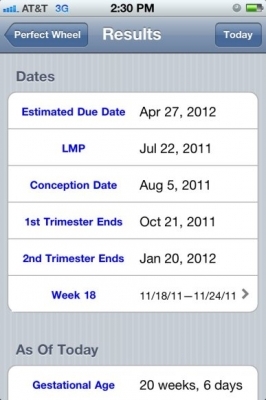 In the first section we are provided with information regarding dates and in the second section information that changes from day-to-day throughout the pregnancy, including expected fetal length & weight for the current gestational age. 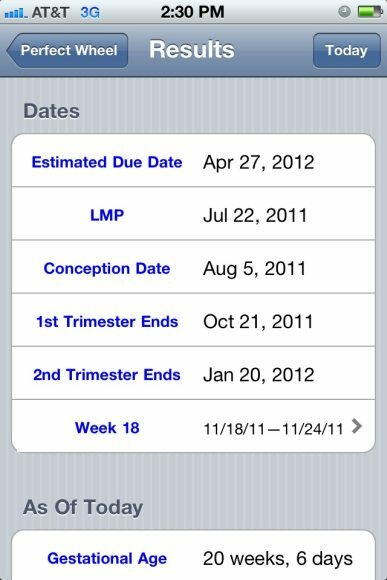 The user also has the option of clicking on “Week X” from the data page and moving between weeks to view dates for a particular point in pregnancy. 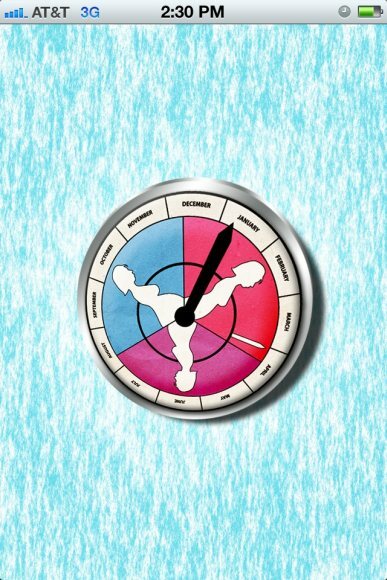 This is extremely useful for quickly choosing dates to schedule time-sensitive appointments, such as anatomy scans and various tests. In the long run this could help avoid miscommunication or miscalculation during scheduling, since everything can be quickly assessed using one tool right in the patient’s room. I tested this out throughout my Ob/Gyn rotation and found it to be my most used clinical application over the course of the 8 weeks. The data consistently matched up with information from traditional wheels and charts, and it appears to be a reliable app (We always encourage providers to use their own judgement, and determine how reliable an app is based on their own testing, as our testing is limited to 8 weeks with the app). My data return was also significantly quicker than that of colleagues inputting information into other apps or using a traditional paper-wheel. The only time I found the app to be a bit difficult to use was in the face of a missed abortion in the Emergency Department. As we measured the crown-to-rump length we wanted to assess approximately how long it had been since the fetus ceased growing. 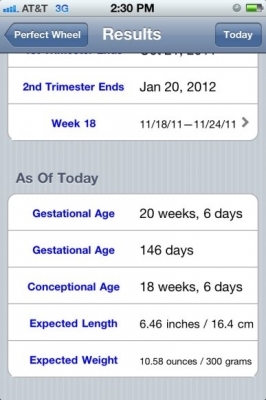 Unfortunately, I could not come up with a quick way to assess this information using the app. Since size data is already provided in the feedback section, I’d imagine this would be an exceedingly easy addition to the app and, while it certainly would not be the most frequently used section of the app, it would definitely prove beneficial in similar situations. If you are a clinical provider that even occasionally sees pregnant patients, this app is well worth trying out.